"It's a snap! This is your chance to rub shoulder pads with Joe Montana, the man who led the "Team of the Eighties" to four Super Bowl Championships. You provide all the fourth quarter heroics, play-calling brilliance, and pinpoint passing as you hit the field against any of 28 pro teams. Call all your own plays! 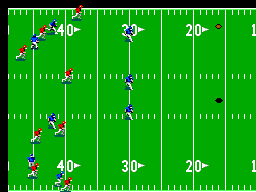 Each team has a playbook with 17 offensive and six defensive options. 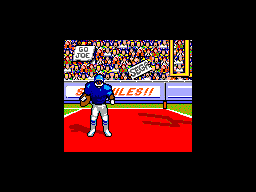 Pick the play that you think will work best, or take the advice of Joe Montana himself, as he recommends the play he would call in each situation. You control the action on the field by switching to the key player as the play unfolds. Your strength and speed will vary by position, just like the real sport. Knock helmets with the computer or punch holes in a friend's defense. Can you keep your head cool and your passing arm hot? Pick your team. Choose the plays. 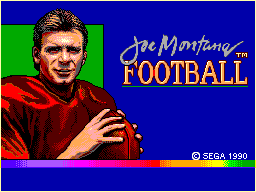 Think you have what it takes to be the next Joe Montana?"